Our ears, and what?s inside them, are a complex and delicate structure, and one that?s very easy to damage. More delicate, in fact, than most of us realise. Hearing loss is on the rise, especially in the elderly population, and our modern life is the cause of it. We use sound all the time ? to communicate, to transmit, to warn. Ours is a world full of sirens, horns, shouting, music and loud vehicles. We relax in the evening ? away from this loud world ? by turning the television up or listening to music. On weekends we unwind and speak over the music to each other in loud bars. It?s no wonder more and more of us are going deaf. Sound doesn?t have to hurt the eardrum physically to cause irreparable damage. The ear, full of tiny, delicate cells, nerves and membranes, damages quite easily. A loud bar, or headphones turned up to drown out schoolkids on a train ? that?s probably causing you damage. Sensorineural Hearing Loss, or SHL for short, is a condition that affects the sense of hearing. People with SHL can be born with it or else acquire it over the course of a lifetime or as a result of a particular incident, such as head trauma or a sudden loud noise. Sudden Sensorineural Hearing Loss is something else entirely, and not to be confused with SHL ? it generally occurs when a trigger, which so far isn?t very understood, produces some problem in the ear and causes partial deafness. This usually lasts for 3 days before the person makes a partial or complete recovery. Hearing loss, either congenital or acquired, can be difficult to treat. It occurs when damage or disorder renders the inner ear (such as the cochlea) ineffective in receiving and transmitting soundwaves as signals to the brain. SHL used to be known as nerve ?deafness?, which is a simple way of looking at a complex situation. There are a number of causes for acquired SHL, with both external (outside world) and internal (the person?s own body) affecting an ear?s health. As it is a complex condition, treatment can be quite subjective. Broadly speaking, SHL differs from conductive hearing loss in one key way. Conductive hearing loss is when sound is being blocked from reaching the inner ear in order to be registered as sound by the brain. On the other hand, SHL is when sound can reach the ear but the sound isn?t being registered. 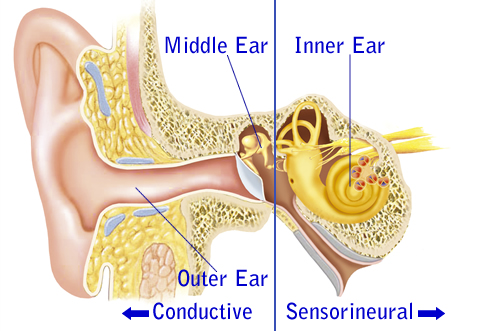 Conductive hearing loss mainly affects exposure of the ear to stimuli. SHL can affect both the volume and clarity of sound. Whereas conductive hearing loss can be treated (as in the case of acquired CHL if the trauma involves barotrauma, for instance) the treatment of SHL depends on a number of different factors (source). Hearing tests are generally available at a GP, who should be able to perform the basics. The basics may simply be for the doctor to cover one of the patient?s ears at a time and speaking at different volumes to determine if there?s anything abnormal. From there, the tuning fork test may be administered, or an audiometer test for further examination. Treatment for SHL varies. As the particular situation varies from person to person, the approach to treatment varies as well. Treatment for less extreme forms of hearing loss can take the form of a hearing aid. Hearing aids are inserted into the ear, where they amplify native soundwaves to make them clearer for the ear to recognise. Another option is the cochlear implant. This is an electronic device which serves to function as a component of the ear itself ? rather than as something to amplify native noise. A cochlear implant converts sound to electrical impulses, mimicking the natural hearing process and stimulating the hearing nerve. By doing this it bypasses the parts of the ear that are unable to function. The Hearing Loss Pill is the newest treatment especially designed for Sensorineural Hearing Loss. This new treatment is designed to improve hearing by targeting the nerves in the inner ear that are still working. The product works by helping the existing nerves transfer more "sound information" into the brain for processing and understanding. While there are some causes of SHL that can?t be avoided, such as ageing or genetics, it?s still important to treat the ears as the fragile instruments they are. Limit time spent in environments with a high level of noise, such as workshops, in traffic or at airports. Obviously, if you?re employed at one of these places, it?s necessary to wear the appropriate type of ear protection to reduce exposure to potentially damaging sound. Removing yourself from the loud noise to take repeated breaks is also a good idea. Think of it this way: we all know how damaging it is to walk around in bright summer sun with little skin protection. We?ve been told it?s a one-way ticket to skin damage and potentially risking skin cancer and melanomas. This is just what happens to your ears when you see a noisy metal band play continuously. You know how bad it is to sunbathe without sunscreen, why would you do the same with your ears? If you are interested in learning more detailed information on the available ways to improve hearing loss, including stem cells, cochlear implants, hearing aids and of course The Hearing Loss Pill, please see our hearing loss treatment page. Q: Are the poorly functioning nerves only in the ear? A: No. The nerves that make up the hearing process are the vestibulocochlear nerve, the processing centers of the brain, or the actual inner ear itself. Q: Are stem cells a possible treatment? A: In the future it is very likely. Right now there is an FDA approved study being conducted to evaluate whether or not hearing problems can be cured using stem cell treatments. We already know that it is supposedly already being successfully used in more exotic countries (without much health regulation), but the safety and effectiveness is questionable, not to mention the $30,000+ price tag on the treatment that health insurance will not pay for. Q: Are there any other names for sensorineural hearing loss? A: Yes. It is frequently also referred to as sensory or nerve hearing loss. A: The closest thing to a cure would be the stem cell treatments. The Hearing Loss Pill is not a cure, but is instead an ongoing treatment to gradually help improve the nerves of the inner ear, and help the brain better process it. Q: What drugs can cause hearing loss? Q: Are there any natural treatments for sensorineural hearing loss? A: Yes. Please learn more from our homepage, or click the banner at the top of the page.